What a difference a year makes, or two years really. After more than a decade of steady growth, the Brazilian outbound market fell off in 2015 with a nearly 7% decline from the year before. But we then saw a nice rebound in 2016 with 14% growth that year and more than 247,000 outbound students. And now the latest research from the Brazilian Educational and Language Travel Association (Belta) finds that a record-high 302,000 Brazilian students went abroad in 2017. This represents a 23% increase over 2016, and overall growth of nearly 40% between 2015 and 2017. Belta values the outbound market at US$3 billion for 2017, which translates to average per-student spending of US$9,989. This too has increased – by 12% – over average spending levels from 2016. 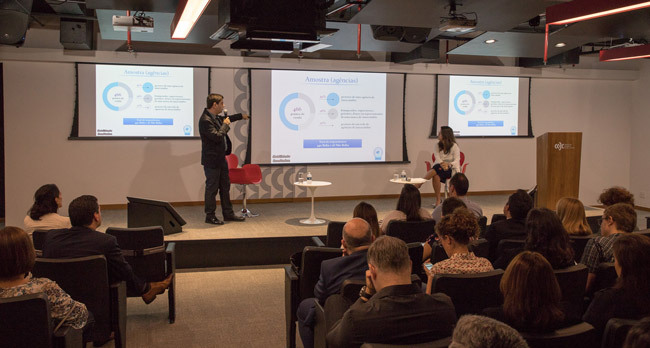 “[The market] grew not only in volume of students but also in revenue because Brazil began to consider more diversified programmes and professional specialisation,” says Belta President Maura Leão. The Belta survey reveals that, as in recent years, the most popular programmes remain language studies and those with temporary work placements. But the 2017 results also show a growing interest in degree studies, and this may have played a part in helping to boost average student spending on study abroad. For the first time in the history of the survey, graduate programmes (reflecting both master’s and doctoral degrees) were among the top ten most-popular study options. The 2017 results reveal as well that demand for undergraduate degrees is also on the rise among Brazilian students. Belta attributes this growing interest in part to some flexibility in the timing of tuition payments for degree studies as well as partial scholarship support extended to Brazilian students by overseas institutions after the winding up of the Science Without Borders scholarship programme. But another factor is that foreign degrees continue to be well-regarded among Brazilian employers and are seen as a way to gain an edge in a competitive domestic job market. In the key area of language study, English and Spanish remain the most popular choices, but Belta is also reporting a growing interest in other languages, including German, French, Italian, Japanese, and Mandarin. “The numbers showcase a new pattern for international education. Brazilians have started to look for the third or fourth languages. The goal is to offer additional skills in the job market,” says Ms Leão. Belta reports that the UK’s upward movement is due in part to more favourable exchange rates between the British pound and the Brazilian real through 2017. 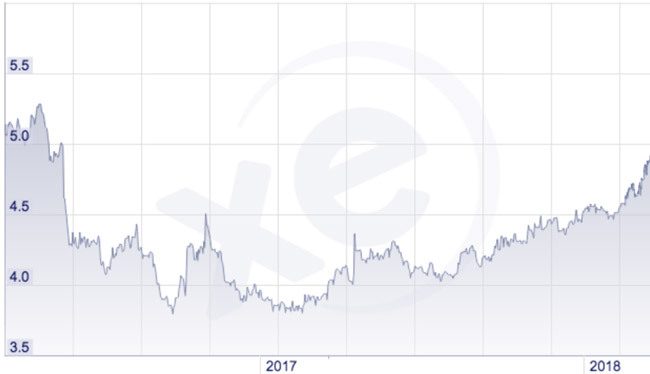 The following chart reflects the cost of a pound, in reais, from May 2017 through April 2018. Expanding on this point, student-respondents to the Belta survey cited “a favourable exchange rate” as the top factor in their choice of study destination, followed by “quality of life”, good support for international students, and opportunities to combine study and work. This entry was posted in Brazil, Higher Education, Language Learning, Most Popular, Regions, South & Central America and tagged Brazilian study abroad market, education abroad, student enrolment, study abroad, Foreign language enrolment.